Coniine refers to a poisonous chemical compound, an alkaloid present in and isolable from poison hemlock (Conium maculatum), where its presence has been a source of significant economic, medical, and historico-cultural interest; coniine is also produced by the yellow pitcher plant (Sarracenia flava), and fool’s parsley (Aethusa cynapium). Its ingestion and extended exposure are toxic to humans and all classes of livestock; its mechanism of poisoning involves disruption of the central nervous system, with death caused by respiratory paralysis. The biosynthesis of coniine contains as its penultimate step the non-enzymatic cyclisation of 5-oxooctylamine to γ-coniceine, a Schiff base differing from coniiine only by its carbon-nitrogen double bond in the ring. This pathway results in natural coniine that is a mixture—a racemate—composed of two enantiomers, the stereoisomers (S)-(+)-coniine and (R)-(−)-coniine, depending on the direction taken by the chain that branches from the ring. Both enantiomers are toxic, with the (R)-enantiomer being the more biologically active and toxic of the two in general. Coniine holds a place in organic chemistry history as being the first of the important class of alkaloids to be synthesized, by Albert Ladenburg in 1886, and it has been synthesized in the laboratory in a number of unique ways through to modern times. Hemlock poisoning has been a periodic human concern, a regular veterinary concern, and has had significant occurrences in human and cultural history. Notably, in 399 BC, Socrates, when he was sentenced to death, chose to die by drinking a coniine-containing mixture of poison hemlock. 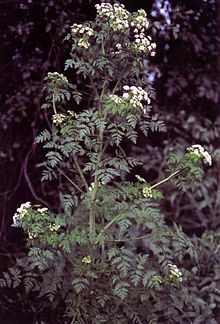 Poison hemlock (Conium maculatum) contains highly toxic amounts of coniine, where it contributes to hemlock’s fetid smell; in addition, it contains trace amounts of other similarly poisonous alkaloids. Ingesting less than a tenth of a gram of coniine can be fatal for adult humans; this is approximately six to eight hemlock leaves. The seeds and roots are also toxic, more so than the leaves. While hemlock toxicity primarily results from consumption, poisoning can also result from inhalation, and from skin contact. The presence of hemlock on farmland is an issue for livestock farmers because animals will eat it if they are not well fed or the hemlock is mixed in with pasture grass. Farmers also need to be careful that the hay fed to animals does not contain hemlock. Poison hemlock is most poisonous in the spring when the concentration of γ-coniciene (the precursor to other toxins) is at its peak. Poison hemlock grows quite tall, reaching heights of up to twelve feet. The stalk of hemlock is green with purple spots and completely lacks hair. A biennial plant, hemlock produces leaves at its base the first year but no flowers. In its second year it produces white flowers in umbrella shaped clusters. Hemlock can be confused with the wild carrot plant; however, this plant has a hairy stem without purple markings, grows less than three feet tall, and does not have clustered flowers. While the hemlock plant is native to Europe and the Mediterranean region, it has spread to every other continent excluding Antarctica. The coniine alkaloid is found in Sarracenia flava, the yellow pitcher plant. [non-primary source needed][better source needed] The yellow pitcher plant is a carnivorous plant found exclusively in the southeastern United States. The plant uses a mixture of sugar and coniine to simultaneously attract and poison insects, which then fall into a digestive tube. The naming of the plant arises from the shape of the opening to these tubes, which resembles a pitcher, which can grow up to three feet tall. The pitcher has a leaf above it that functions to prevent rain from diluting the digestive fluids deep in the tubes. There are no reports online of human poisoning via the yellow pitcher plant, perhaps because only a small portion of the plant contains coniine, or because it does not contain enough to produce toxicity. It is also not as widespread as hemlock and therefore is less likely to be encountered by humans. Coniine is also found in Aethusa cynapium, commonly known as fool’s parsley. The history of coniine is understandably tied to the poison hemlock plant, since the natural product was not synthesizable until the 1880s. The most famous hemlock poisoning occurred in 399 BCE, when the philosopher Socrates is believed to have consumed a liquid infused with hemlock to carry out his death sentence, his having been convicted of impiety toward the gods, and the corruption of youth. Hemlock juice was often used to execute criminals in ancient Greece. Hemlock has had a limited medical use throughout history. The Greeks used it not just as capital punishment, but also as an antispasmodic and treatment for arthritis. Books from the 10th century attest to medical use by the Anglo-Saxons. In the Middle Ages it was believed that hemlock could be used to cure rabies; in later European times it came to be associated with flying ointments in witchcraft. Native Americans used hemlock extract as arrow poison. While the yellow pitcher plant and fool’s parsley also contain coniine, there are no reports of traditional uses for these plants. The (R)-(−) enantiomer of coniine is the more biologically active, at least in one system (TE-671 cells expressing human fetal nicotinic neuromuscular receptors), and in mouse bioassay, the same enantiomer and the racemic mixture are about two-fold more toxic than the (S)-(+) enantiomer (see below). Coniine, as racemate or as pure enantiomer, paralyzes muscles when one or the other molecule blocks the nicotinic receptor on the post-synaptic membrane of the neuromuscular junction. This results, systemically, in a flaccid paralysis, an action similar to that of curare. Symptoms of paralysis generally occur within a half-hour, although death may take several hours. The central nervous system is not affected: the person remains conscious and aware until respiratory paralysis results in cessation of breathing. The flaccid, muscular paralysis is an ascending paralysis, lower limbs being first affected. The person may have a hypoxic convulsion just prior to death, disguised by the muscular paralysis such that the person may just weakly shudder. Cause of death is lack of oxygen to the brain and heart as a consequence of respiratory paralysis, so that a poisoned person may recover if artificial ventilation can be maintained until the toxin is removed from the victim’s system. The LD50 values (in mouse, i.v. administered) for the R-(−) and S-(+) enantiomers, and the racemate, are approximately 7 and 12, and 8 milligrams per kilogram, respectively. (+/–)-Coniine was first isolated by Giesecke, but the formula was suggested by Blyth and definitely established by Hoffmann. D-(S)-Coniine has since been determined to be a colorless alkaline liquid, with a penetrating odour and a burning taste; has D0° 0.8626 and D19° 0.8438, refractive index n23°D 1.4505, and is dextrorotatory, [α]19°D +15.7°. (See comments about the specific rotation below, under “Enantiomers”.) L-(R)-Coniine has [α]21°D 15° and in other respects resembles its D-isomer, but the salts have slightly different melting points; the platinichloride has mp. 160 °C (Löffler and Friedrich report 175 °C), the aurichloride mp. 59 °C. Coniine gives no coloration with sulfuric or nitric acid. Sodium nitroprusside gives a deep red color, which disappears on warming, but reappears on cooling, and is changed to blue or violet by aldehydes. Naturally-occurring coniine is present in Conium maculatum as a mixture of the R-(−)- and S-(+)-enantiomers. The stereochemical composition of “coniine” is a matter of some importance, since its two enantiomers do not have identical biological properties, and many of the older pharmacological studies on this compound were carried out using the naturally-occurring isomeric mixture. S-(+)-coniine, identical to D-(+)-coniine, has [α]D = +8.4° (c = 4.0, in CHCl3). These authors note that Ladenburg’s value, +15°, is for a “neat” sample, undiluted with any solvent. A similarly high value of +16° for the [α]D of “coniine” is given, without explicit citation of the source, in The Merck Index. Salts of given enantiomers do not necessarily have the same specific rotation as the same enantiomer of the free base. The hydrochloride salts of the (S)-(+) and (R)-(−) enantiomers of coniine have values of [α]D of +4.6° and -5.2°, respectively (c = 0.5, in methanol). In the original synthesis of this substance by Ladenburg in 1886, N-methylpyridine, as its iodide salt, was isomerised at 250 °C to obtain 2-methylpyridine (α-picoline). Reaction of this, as shown in the scheme below, with the cyclic trimer of acetaldehyde, paraldehyde, in the presence of a base gave 2-propenylpyridine via a Knoevenagel condensation. This intermediate was reduced with metallic sodium in ethanol or by hydrogen gas (as shown) to provide racemic (±) coniine. Enantiopure coniine was then obtained by a chiral resolution, specifically, fractional crystallisation of the diastereomeric (+)-tartaric acid salt. The initial reaction, however, gives a poor yield and was improved by interaction of the two reagents at 150 °C in sealed tubes to give methyl-2-picolylalkyne, which was then heated at 185 °C with hydrochloric acid for 10 hours, producing a mixture of 2-propenylpyridine and 2-chloropropylpyridine. This mixture was reduced to rac-coniine by sodium in ethanol. The preparation of L-(R)-coniine by the reduction of β-coniceine (L-propenylpiperidine) by Löffler and Friedrich is interesting as a means of converting conhydrine to L-(R)-coniine. [excessive detail?] Hess and Eichel reported, incorrectly, that pelletierine was the aldehyde (β-2-piperidyl-propaldehyde) corresponding to coniine, and yielded rac-coniine when its hydrazone was heated with sodium ethoxide in ethanol at 156–170 °C. According to these authors, D-(S)-coniine is rendered almost optically inactive when heated with barium hydroxide and alcohol at 180–230 °C. Leithe has shown by observation of the optical rotation of (+)-pipecolic acid (piperidine-2-carboxylic acid) and some of its derivatives under varying conditions, that it must belong to the D-series of amino acids. The complete biosynthesis of coniine is still being investigated. While the exact mechanism is still to be determined, much of the pathway has been elucidated. Originally thought to use 4 acetyl groups as feed compounds for the polyketide synthase that forms coniine, recent work has led to the conclusion that two malonyl and a butyryl CoA are what is coupled together before further operations are performed to finally form coniine. Initially, acetate is converted to acetyl-CoA, some of which is also used to form malonyl CoA. An acetyl CoA is further elongated using malonyl-CoA by fatty acid synthase to form butyryl-CoA. Further elongation of butyryl-CoA using 2 malonyl-CoA forms 5-ketooctanal. Ketooctanal then undergoes transamination using alanine:5-keto-octanal aminotransferase. The amine then spontaneously cyclizes and is dehydrated to form the coniine precursor γ–coniceine. This is then reduced using NADPH dependent y-coniceine reductase to form coniine. Coniine is the murder weapon in Agatha Christie‘s mystery novel Five Little Pigs. ^ Peters, Amy; Bouska, Cassie. “Poison Hemlock”. Osu Extension Service. Retrieved 3 May 2015. ^ Cheeke, Peter (31 Aug 1989). Toxicants of Plant Origin: Alkaloids, Volume 1 (1 ed.). Boca Raton, Florida: CRC Press. p. 118. ISBN 978-0849369902. ^ “Poison Hemlock: Options for Control” (PDF). co.lincoln.wa.us. Lincoln County Noxious Weed Control Board. Retrieved 3 May 2015. ^ “Poison Hemlock”. pierecountryweedboard.wsu.edu. Pierce County Noxious Weed Control Board. ^ “Poison Hemlock” (PDF). store.msuextension.org. Montana State University. Retrieved 3 May 2015. ^ Vetter, J (September 2004). “Poison Hemlock (Conium maculatum L.)”. Food Chem Toxicol. 42 (9): 1374–82. doi:10.1016/j.fct.2004.04.009. PMID 15234067. ^ a b Moser, L; Crisp, D. “Poison Hemlock” (PDF). San Francisco Peaks Weed Management. Retrieved 3 May 2015. ^ N. V. Mody; R. Henson; P. A. Hedin; U. Kokpol; D. H. Miles (1976). “Isolation of the insect paralyzing agent coniine from Sarracenia flava“. Experientia. 32 (7): 829–830. doi:10.1007/BF02003710. ^ Mackie, Robin. “Yellow Pitcher Plant or Trumpets”. United States Department of Agriculture. United States Department of Agriculture Forest Service. Retrieved 3 May 2015. ^ Chisholm, Hugh, ed. (1911). “Conine” . Encyclopædia Britannica. 6 (11th ed.). Cambridge University Press. p. 942. ^ James Warren (2001). “Socratic suicide”. Journal of Hellenic Studies. 121: 91–106. doi:10.2307/631830. JSTOR 631830. PMID 19681231. ^ R. G. Frey (1978). “Did Socrates commit suicide?”. Philosophy. 53 (203): 106–108. doi:10.1017/S0031819100016375. ^ “The Suicide of Socrates”. EyeWitness to History. Retrieved 3 May 2015. ^ Grieve, M. (1971). A Modern Herbal (2nd ed.). Mineola, N.Y.: Dover Publications. p. 392. ISBN 978-0-486-22798-6. Retrieved 3 May 2015. ^ a b c d e Stephen T. Lee; Benedict T. Green; Kevin D. Welch; James A. Pfister; Kip E. Panter (2008). “Stereoselective potencies and relative toxicities of coniine enantiomers”. Chemical Research in Toxicology. 21 (10): 2061–2064. doi:10.1021/tx800229w. PMID 18763813. ^ Blyth, J. (1849) “On the composition of coniine, and its products of decomposition,” Quarterly Journal of the Chemical Society of London, 1 : 345–363. Blyth found the empirical formula of coniine to be (p. 351): C17H17N. The error in the amount of carbon is due, in part, to his having assumed that the atomic mass of carbon is 6, not 12 — a common error at the time. ^ Hoffmann, A. W. (1881) “Einwirkung der Wärme auf die Ammoniumbasen: 2. Coniin” (Effect of heat on ammonium bases: 2. Coniine), Berichte der deutschen chemischen Gesellschaft, 14 : 705–713. ^ Panter, K. E. and Keeler, R. F., Ch. 5: Piperidine alkaloids of poison hemlock (Conium maculatum) in: Cheeke, Peter R., ed., Toxicants of Plant Origin: Alkaloids, vol. 1 (Boca Raton, Florida: CRC Press, Inc., 1989), p. 116. ^ a b Löffler and Friedrich, Ber., 1909, 42, 107. ^ Craig J. Cymerman; A. R. Pinder (1971). “Improved method resolution of coniine”. Journal of Organic Chemistry. 36 (23): 3648–3649. doi:10.1021/jo00822a051. ^ A. Ladenburg (1888) Justus Liebig’s Ann. Chem. 247 1-98. ^ a b D. Enders and J. Tiebes (1993) Liebig’s Ann. Chem. 173-177. ^ G. R. Clemo; G. R. Ramage (1932). “Octahydropyrrocoline”. Journal of the Chemical Society: 2969–2973. doi:10.1039/JR9320002969. ^ George William Clough (1918). “The relationship between the optical rotatory powers and the relative configurations of optically active compounds. The influence of certain inorganic haloids on the optical rotatory powers of α-hydroxy-acids, α-amino-acids, and their derivatives”. Journal of the Chemical Society, Transactions. 113: 526–554. doi:10.1039/CT9181300526.